"Michael, I absolutely LOVE the wisdom you share in this video. I also hope people pay attention to how you are giving away free video content in order to establish an authority and trust base for your coming videos as well as your great offer that is certain to follow. Well done!" "Thanks for your clear and concise information. The platform you described will allow me a second chance at a online career. It seems like at age 60+, people want to professionally put you "out to pasture." Seems sad but true. Cyber space and digital platforms recreate opportunities for people of all ages and demographics." 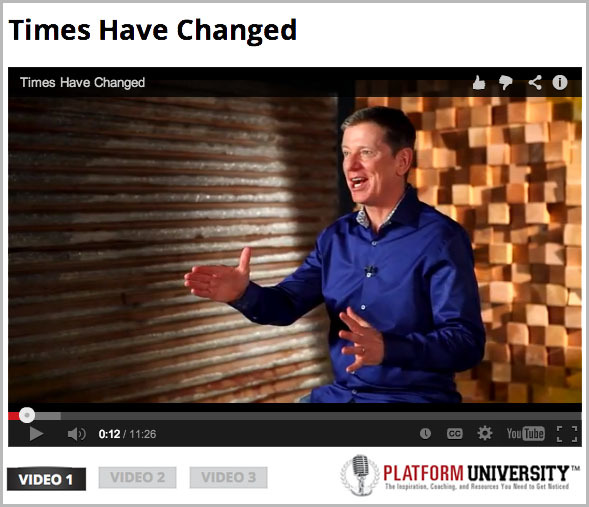 There seems to be a new video course that's being made by Michael Hyatt. As I watched the first video, my mind went to CAM. Indeed, this is exactly what CAM needs to hear. We at CAM have a message and a passion to get our music out there, and we are often held back due to gatekeepers (music publishers, record companies, the dearth of Catholic radio opportunities), along with our desire to juggle our personal and family lives along with our dream. And as the recession and digital media have plummeted many of these opportunities, a new approach is rising, and has been rising, for people to take charge of their dream, and do so with far less compromising the responsibility one has with raising a family. Here is the link to the first article, with instructions to how to get the first video. I went to Michael Hyatt's Platform conference last year, and it was life-changing. I have since received access to some of his other courses. He is the real deal. He is passionate and knowledgeable, and is able to bring non-techies into the fast-track of mastering this new world, in a way that no other conference has been able to. I suspect it will lead to a promotion for a video package. If it's like the video package he completed last time, it will be affordable for the first few days, and then the price will skyrocket afterwards. If this video series appeals to you, you are going to want to be ready beforehand. Again, here is a link to the first article and then instructions to get the first video. Michael Hyatt is showing us the way for us to move ahead in our respected ministries and talents.